Welcome to the home of the Co-Leash Dog Collars! 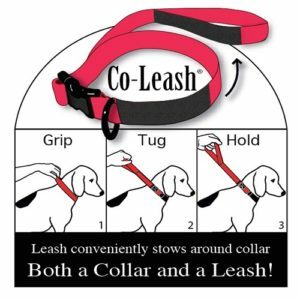 The Co-Leash is a dog collar and leash combined that’s always on the dog when you need it. The law states your dog must have a leash on at all times, but how can we reasonably do that? This is the question that inspired the Co-Leash. The Co-Leash features a short control leash which wraps neatly around the collar and attaches with strong Velcro. Its made with super strong nylon, a Big Dog Buckle for added strength, and welded D-rings that can be used in conjunction with a regular leash as well. The Co-Leash is perfect for Agility and Fly ball, great for dog parks, and while walking 2 dogs at once as the Co-Leash makes it much easier to control them both when they are wearing their leashes already with their collars. The Co-Leash is also great for elderly dogs who need a little guidance now and then to get around obstacles. The neatly tucked leash makes it easy grab its handle and guide your pet through any situation or weather conditions and increases your pet’s safety at the same time. Try our products today and see why Co-Leash company leads the industry in innovative products for your pets. We’re sure the Co-Leash and Co-Leash products will make life with your pet a little easier and your pet a little safer. We’ll even save you money by incorporating more than one function in every product – and they last a long time too.